The Geneva Steel Mill in Vineyard has been a landmark in Utah County for more than 50 years, providing thousands of jobs and attracting many businesses to the area. At its peak of operations, Geneva Steel was the largest steel mill west of the Mississippi River and produced 60 percent of the steel used in the Western United States. However, increasing labor costs and the decline of manufacturing industries has contributed to the decline of the company and ultimately the bankruptcy of Geneva. The liquidation of Geneva has brought many opportunities to land developers in recent years, mainly residential. The explosive growth of Vineyard is expected to mature to over 12,000 residents in the next few years, an increase of more than 400 percent. 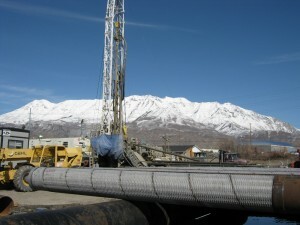 With the foresight of future growth, the Central Utah Water Conversancy District purchased the water rights from Geneva with plans to drill new groundwater wells and install a pipeline to deliver water to residents of Northern Utah County and Southwest Salt Lake County. “The Wells @ Vineyard” project will drill and develop three new groundwater wells in Vineyard – each delivering up to 6,000 gallons of the “Best Tasting Water” per minute. The wells will be as deep as 1,600 feet below the surface – the same height as the John Hancock building in Chicago, which is 100 stories tall. In addition to drilling and developing the wells and pipeline, the District will construct pump houses for each well. Work is scheduled to begin in fall 2017 and continue through 2020. Construction on seven additional wells will also take place over the next several years. In all, this project will provide approximately 53,300 acre-feet of high-quality culinary water and approximately 10,500 acre-feet of secondary water to customers and communities. Learn more about this project and sign up for email updates at thewellsatvineyard.com.